← Men! We need you watching on the wall. This year’s Acton University ended with bang. Peter Kreeft gave a talk on the last day in which he made some great comments about music, including music used in church. I think the recording will soon be available. It’s a blast. Also, I want to bring to the attention of the readership that there is a scholarship available through Acton Institute: The Calihan Academic Fellowship. The Calihan Academic Fellowships provide scholarships and research grants to future scholars and religious leaders whose academic work shows outstanding potential. Graduate students and seminarians currently studying theology, philosophy, economics, or related fields must demonstrate the potential to advance understanding in the relationship between theology and the principles of the free and virtuous society. Such principles include recognition of human dignity, the importance of the rule of law, limited government, religious liberty, and freedom in economic life. This entry was posted in Just Too Cool, Lighter fare, Liturgy Science Theatre 3000 and tagged Acton Institute, Acton University, Peter Kreeft. Bookmark the permalink. Is “refuse” really the accurate translation of “??????? “? Anita Moore, O.P. (lay) says: Is “refuse” really the accurate translation of “skubala “? How did we get to this appalling situation where the prayer of the church is drowned in the music of the world? Partly it is the attitude that what matters is validity and following the rules and that everything else you do in the liturgy is up for grabs. The common prayer of the church should be sung and this requires a standardized system of sacred chant that subordinates the melody to the text. Where there are choirs that can handle the music, there is a place for sacred polyphony. It was a fundamental mistake to implement a vernacular liturgy without a mandated system of chant to go with it. Christian rock is an insult to rock as well as to Christianity. They do not even rise to the dignity of heresy. I wasn’t there, but frankly, Peter Kreeft sounded kind of gross. [Indeed, you weren’t.] I’m all for beautiful music in Catholic churches (bring on the Gregorian chant and Palestrina! ), and I agree that there’s a lot of depressingly mediocre stuff sung in many parish churches. But really! Can’t we leave the bathroom humor to the secular world? Skubala is stuff thrown to the dogs, or possibly that the dogs throw around. This included refuse and trash and table scraps, but also dung. So if we are letting songwriters and music publishers throw us any old scraps they come up with, which is often what happens, it is skubala. But yeah, anything that is of purely human effort is not sacred but skubala. That is why we don’t do readings from the Book of Shakespeare at Mass; he is a great writer and poet, as great as a human can be, but he isn’t a prophet or evangelist or psalmist. In a sacred context, his best would be trash; and that would be unfair to Shakespeare as well as disrespectful to God and cruel to the congregation. Inspired sacred writing is different, and sacred music is also different and inspired (albeit not the same way as the Bible). That is why it is the only music worthy of being a “reading” at Mass. I should add that religious but not sacred music, like devotional music, sung prayers, etc., is not skubala when it is not being used for Mass or other sacred purposes. Bringing religious devotion into normal life is good! Treating Mass like it is no holier than normal life – that is what is a waste of time and life. But we have a weird loss of our sense of priorities in this modern world, and that includes our sense of what is the right behavior for different occasions. Oh, dear. The history of Western Church music is a little more complicated than Prof. Kreeft seems to indicate. A reform movement comes about roughly every 500 years, so we are due for one, about now. The unfortunate thing is that these movements are also accompanied by a reform of the liturgy and theology. This is not the first period of history where the Church has had to reform its music, even from very bad worldly accretions. Prof. Kreeft may not know that during the 1960’s and 1970’s, when much of the banal music used in churches, today, was being written, the United States was, technically, considered missionary territory and according to the documents on music of the time, missionary countries were allowed to use indigenous musical forms in liturgical functions (with the usual caveats). Given that the indigenous music in the U. S. was folk music, it was, technically, acceptable to used folk-like music in liturgical functions. Thus, the talk of beauty, etc., ignores the permissions of the time. Now, the U. S. is no longer classified as a missionary country, so folk-like music, since the late 1980’s is, technically, no longer allowed. Thus, complaining about beauty is a tricky thing, because there are many examples of folk music, historically, that has been quite beautiful. Folk music does not have to be undignified. One need only think of Arlo Guthrie, for example, or Peter, Paul, and Mary, as performers. Let’s be clear – many Church music composers of today are just mediocre composers. The real criticism should be that the contemporary music is illicit for liturgical use, not that it is merely poor music, because folk music can be written that beautiful. As for chant, proper, we have only a sketchy history of its development before about 1000 A. D. It was, almost certainly, not all written by professional composers. Hear! Hear! Reclaim sacred music! Bannish the Reverberating Tribal Drums, the Strummed Guitar, the repetitive, me-centered, toe curling, infantile rubbish! Peter Kreeft is an excellent author. The first book of his that I read was Jesus Shock, an easy afternoon read. I liked it so much, I purchased the book he wrote with Fr. Tacelli- the Handbook for Catholic Apologetics. 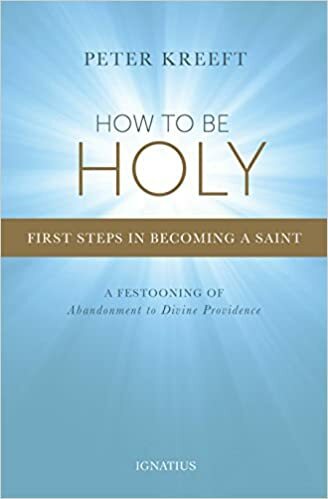 This is a must have book for any serious Catholic, and should be on the shelf/ in you Kindle next to the Summa and the Catechism.